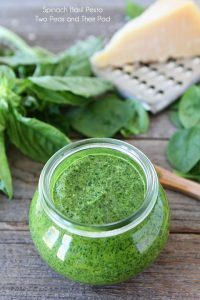 Traditionally, the pesto is made with basil, pine nuts, olive oil, parmesan cheese, garlic, salt and pepper. However, there are many delicious alternatives that you can make with other greens and cheese you have in your fridge. It’s good on pasta, on top of toast, or as a dip for your favorite veggies! Place all ingredients in a blender or food processor and blend until smooth. If the pesto is too thick, slowly add 1 Tablespoon of water at a time until you have reached your desired consistency.